A recent tweet* from my pal Stephen Glenn gave me pause. Pyramid die roller image by BGG user duchamp. Sure, it’s a gimmick, but it’s a clever one and I like it. It works like this; place the five color-coded dice into the Pyramid, shake it, invert it on the game board, press and release the slider, and it deposits a randomized die on the table. As Stephen said, one could simply pull dice from a bag and roll them. It would be cheaper to manufacture and maybe even easier in play, and that’s the way most publishers would handle it. But the decision to include the Pyramid die roller was a smart one, and might even have been a factor in Camel Up’s Spiel de Jahres win. Something I noticed about two of the three SdJ nominees–Camel Up and Splendor–was that both have an unusually tactile component that encourages players to playfully interact with the game in ways that most Euro games don’t. In Camel Up, when a player wants to advance the camels, she takes a Pyramid tile and then must, “take the Pyramid, shake it thoroughly, and reveal one Die from it.” It sounds silly, but that element of playful physicality bolsters the players’ engagement with the game. Additionally, that simple act of shaking the Pyramid and plunking it down to reveal a die adds a dose of drama to the proceedings. In my experience, the shake-up and reveal is never quite a smooth operation, and the other players invariably lean in, eager to see the final results. And as we know: drama is anticipation mingled with uncertainty. Splendor jewel chip image by BGG user duchamp. Splendor, on the other hand, doesn’t have that kind of mechanical gimmick. What sets Splendor apart is its use of weighted, poker-style chips for the jewel tokens. Here is another game component that could have been made with cheaper materials to save money. It was a deliberate physical design choice by the publisher to use expensive, heavy poker chips rather than the usual punch board tokens. Why use heavy poker chips? Because they’re heavy poker chips. Splendor is a game about jewel trading, and these weighty jewel chips lend a sense of premium value with their substantial presence and through their association with gambling games. Here is a game component that, by its sumptuous nature, elevates a rather thin theme. Poker chips encourage playfulness; they feel good in your hand, they stack nicely, and they make an enticing clink when you riffle and stack them. You feel prosperous as you sit at the table, counting and riffling and stacking your little hoard of clinking jewels. Punch board tokens just don’t inspire the same feelings in players. Without the weighted poker chips, Splendor would simply be a less fun experience. Bruno Faidutti recently blogged about how different component choices affected the resolution of a rock-paper-scissors mechanism in a game he’s designing with Eric Lang. First they tried secret dials, but set them aside as too costly to produce. Then they replaced the dials with cards. The results were similar, but players preferred the dials. Now comes the real experience. Get rid of cards and dial, and play this à la Rock / Paper / Scissors. A closed fist means War / Greed, an open Hand means Peace, a thumb up means 1. Theoretically, this system is equivalent to the two former ones. When playing, however, the feeling is very different, and it seems that the results are slightly more aggressive, with more wars and less peace. May be holding one’s arm makes one aggressive, maybe the requirement to play fast, without hesitation, makes us less careful? Anyway, it’s the same game, but it plays a bit differently. 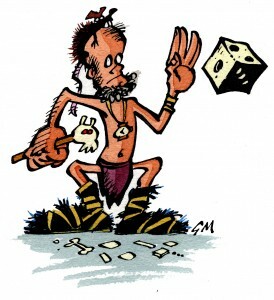 I love Camel Up, but it just wouldn’t be the same drawing a die from a bag. And Splendor with cardboard jewels? Sure, ok. I can’t say that the Pyramid die roller clinched the SdJ win for Camel Up or that those poker chips alone got Splendor nominated, but I do know that carefully considered components can greatly enhance the experience of games. * Stephen’s tweet was in jest. I’m using it as a conversation starter. To be clear — I’m not a fan of the pyramid in Camel Up, but it doesn’t make me as violently angry as my tweet suggests. I had just started the 5:2 diet that day and the joke was that even the slightest thing could push me over the edge. See? Jokes are so much funnier when you get to explain them.